Our course is organized by “make cycles,” a term I borrow from Connected Learning. You can find the tasks for each cycle in the drop down menu above. We will share most of our work in a Google+ Community. We will upload images, respond to each other’s ideas, and share links and “makes” here. Makes are looking great! Remember if you’re using Storyjumper to share from the “Share” button; we should see a thumbnail (book cover typically) if the link shares correctly. Also, a few were flagged as spam and I needed to approve those, which I just did, so we should be all set. I’ll keep watching for others. Storytelling makes are due tonight (9/23). Please remember to tell us about your process AND comment on a peer’s story once you share. Love your comments to each other; thank you! Make Cycle 3 is now posted. Link on our site and HERE. We are moving to informational/expository texts and reading more in About the Authors. You all did such great work with chapter 1 and noticing kids’ writing! I have one pretty creepy mentor text this make cycle too (during week 6) because it’s October. 😉 Edward Gorey’s The Gashleycrumb Tinies should remind you a lot of Tim Burton and hopefully you can get through the dark humor…not intended for little kids! 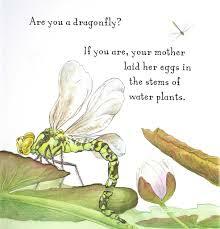 But no fear, I paired that mentor text with a sweet book about Dragonflies so not everything is creepy. I’ll get grade updates for Make Cycle 2 done in the next day or so. Really appreciate your work! Our featured curators for this cycle are Giselle, Daniela, Suzy, Mckenzie, Keith, and Miriam. They will be highlighting the ideas and your makes for Make Cycle 2. Friendly reminder to the 6 of you that you’ll share your featured curator assignment with me by Tuesday. Thanks again to the Make Cycle 1 team! Appreciate all of you and the work you are doing. Online courses: I’m good at checking email.